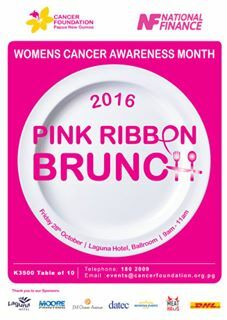 THE annual Pink Ribbon Brunch has been launched in Port Moresby to promote awareness on women’s cancer in October. The Papua New Guinea Cancer Foundation (PNGCF) announced the return of The Pink Ribbon Brunch, to be hosted on Friday 28th October in Port Moresby. “National Finance Ltd is so proud to be the new sponsor of PNG Cancer Foundation’s 2016 Pink Ribbon Brunch” Mr Dickinson said. “The Pink Ribbon Brunch will be held at Laguna Hotel and we invite all our supporters to join us to raise as much money as possible to raise awareness on women’s cancer and provide education and support for the women and families affected by it,” he said. PNG Cancer Foundation will use the funds from this event to educate the people of PNG on how to protect their families from cancer, provide free cancer screening and workshops at various locations around the country, and work with partner organisations to improve cancer control in the country. PNGCF chief executive officer Dadi Toka Jr said that next month the foundation will host activities that address women’s cancers in PNG. “Current statistics indicate that two women are dying every day from cervical cancer in PNG and 9 per cent of hospital admissions in Port Moresby are a result of patients diagnosed with breast cancer. “Protect your family. Don’t smoke, don’t chew betelnut, reduce your alcohol intake, eat a healthy diet and exercise regularly” he said. Mr Toka expressed appreciation to National Finance Ltd for actively being involved in the work of PNG Cancer Foundation.